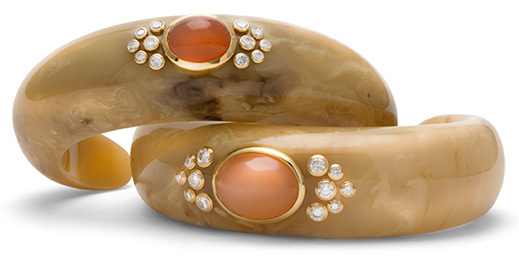 Hand-carved cuffs of vintage bakelite with diamonds and moonstone in 18 karat gold. Mark Davis jewelry is not available everywhere and that is just how we like it. We work with a very select group of retailers that we feel share our commitment to the best. Our retailers have in-depth knowledge of our products and strive to provide the utmost in customer service. If you see an item on our website and would prefer to purchase it from one of the retailers listed, please contact the retailer or Mark Davis.